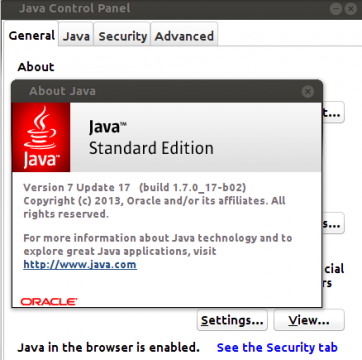 Oracle Java has been removed from the official Ubuntu repositories due to the new Java license. If you need to use Oracle Java instead of OpenJDK in Ubuntu, this simple tutorial will show you how to install Oracle Java (JDK which includs JRE) 6 / 7 / 8 in Ubuntu 13.04 using the ppa repository. The Webupd8 Team created a ppa with packages which automatically downloads Oracle Java JDK from its official website and installs it on your computer. They are oracle-java6-installer, oracle-java7-installer, and oracle-java8-installer. The ppa supports for Ubuntu 13.04, 12.10, 12.04 and 10.04. To get started, hit Ctrl+Alt+T to open a terminal window for running commands. Or, change the number 7 to 6 or 8 to install Java6 or Java8. 4 users responded in " Install Oracle Java (JDK) 6 / 7 / 8 in Ubuntu 13.04 "
I did exactly what you said. I tried it three times on ubuntu version 12.04. So I don’t have the old version of java or the new version. Same here. Worked perfectly fine on a fresh install of Ubuntu 13.04 x64. Seems it does not come with OpenJDK, but just in case I used that command and it reported nothing to remove/purge. Then added the ppa, installed java, accepted the license… and java, javac started working. worked well on xubuntu 13.04 64 bit.